Composer/Improvisor/Reed player Jason Robinson is part of the San Diego music community and a founding member of the Trummerflora collective that includes many of the Accretions artists. Tandem consists of a series of collaborations (12 duo, one trio, and one solo) involving various musicians, most of whom I recognize as members of Trummerflora or other Accretions projects. Nearly all the music is improvised and, as pointed out in the liner notes, even the composed pieces rely heavily upon improvisation. There's plenty of variety on the set as Robinson treats us to both accessible jazz and abstract experimentation. Anthony Davis on piano contributes to two tracks. Robinson's tenor sax and Davis' piano duke it out in a frantic jazz duel on "Now And Here". And "C.T. ", at nearly 20 minutes, is by far the lengthiest track of the set, giving the musicians plenty of elbow room to stretch out and develop. 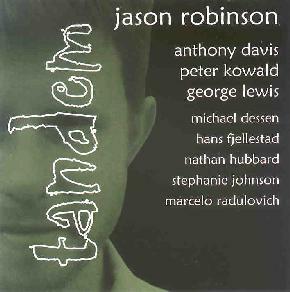 Davis creates a measured tension with tense and moody patterns as Robinson jams in his lyrical style. The themes shift a number of times as the duo explore various jazz stylings, and there's some really beautiful and often romantic melodic sequences. A highlight of the set is a smokin Coltrane styled duo with drummer Nathan Hubbard. Wonderful playing from both musicians. There are two tenor sax/trombone duos with George Lewis featuring more dueling (and HOT playing) as well as exploring the range of sounds produced by and through their instruments with breathing and voice. Somewhat similar are the two duos with trombone player Michael Dessen. On the more adventurous side is the sound sculpture trio of Stephanie Johnson on electronics, Robinson on tenor, and Peter Kowald on contrabass. The barely recognizable instruments are in stark contrast to the later Robinson/Kowald duo. More creative fun can be had with Marcelo Radulovich who uses radio and electronics to create sound and noise patterns against which Robinson kicks out jazz runs. The contrasts are striking and works surprisingly well. A second track from this duo is far more atmospheric, featuring the instruments creating thematic mood swings against a single noise pattern that gradually increases in volume as the music progresses. And if the noise seems grating wait until it abruptly stops... it provides more of a shock than relief. One of my favorite tracks on the disc. Along the same lines are the collaborations with Hans Fjellestad on analog synths, who provides frenetic electronic mayhem to match Robinson's raging horns. Wild stuff and great fun. Honestly, by now I've heard a fair number of Accretions releases and this is one hot label featuring some of the most exciting and interesting modern music around. For more information you can visit the Jason Robinson web site at: http://www.jasonrobinson.com. Tandem is distributed by Accretions. You visit their web site at: http://www.accretions.com.